It’s been a tough week. Let’s look at some footwear. Boots are well-known Goth aphrodisiac. From pointy-toed and elfin to platform stompers, Goths love boots. I have far too many pairs, so I’m endeavoring to wear some of them more often. It’s still quite hot here and I haven’t done well on that front. Boots are just another reason Goths love Fall/Winter. The Goth look is really not engineered for survival in hot climes. All the above are covetable boots I’ve found recently by summoning the astral travelers of the intertubeway. (Note to self: “Intertubeway Army,” perfect name for a Gary Numan-internet meme crossover tribute band.) On the top left, we have black iridescent Doc Martens. Nineties nostalgia is in full swing amongst the youths, which may explain why I’ve noticed a resurgence in popularity of Docs. There are many more finishes and materials than were available in the 90s. Oxblood used to be exotic, but now there are metallics, neons, and fabrics. I’m actually quite in favor of kids jumping on the Docs trend if it means the company can offer greater variety. I haven’t seen these in person yet, but I have a ridiculous interest in anything with that oil-slick reflectivity. Anecdata suggests that the quality of the current line of Docs is nowhere near what was available in the 80s-90s. I do have several pairs of Docs and I have noticed that the fit is a bit different. For example, these Dr Marten Alloys I wore for Dragoncon. Even though I ordered the same size I always get, they felt huge. My foot was slipping around inside the boot all day, even with two pairs of thick socks on. The material was also quite soft. I understand the upper was meant to be distressed, but it had no stiffness to it at all, which further exacerbated the foot-slipping-around business. Because the sole is quite heavy and the upper is very soft, every time I picked up my foot I felt the weight of the sole shifting. Well, proceeding. In the opposite corner, we have platform boots from Velvet Angels. These have contrasting textures and a metallic heel. A thick heel like this on a platform boot is a must for me. I don’t know how people do it with those little cocktail-straw heels, but then I wore combat boots exclusively through most of my 20s and I’ve never had the knack of being totally comfortable in heels. I’m fine for short events, but I certainly couldn’t, say, walk around a city in heels of any sort. Just under the iridescent Docs we have a pair of platform boots from Topshop. Again, chunky metallic heel. I’m pleased to see that there won’t be any shortage of chunky platforms in shops this Fall/Winter season. To the right, we have a pair of belted platforms by Dollhouse. Loads of buckles are totally Goth, just ask Edward Scissorhands. On the far right, glitter booties from Baker’s Shoes. I like this thick, yet tapered heel and the pointed toe. These look like great boots for a long skirt. Glitter-encrusted stuff is appealing to me, though I normally avoid anything to femmey-cutesy. I say that’s my inner Ziggy Stardust emerging. Back to the lower left corner, we have a pair of extreme pointy toes from Fluevog. I’ve always wanted a pair of Fluevogs, but have yet to fulfill that desire. I love how unique their styles are, but there’s often one sticking detail that keeps me from ever pulling the trigger–besides the price. I’m a bit gun-shy on expensive boots since I destroyed a $400 pair of New Rocks in two months. Yes, that’s right. These are almost perfect 80s deathrock-style cockroach kickers (also called winklepickers). The one large buckle is a nice detail. I’m less thrilled about the fold-down top–which looks kind of sloppy to me–and the wooden heels. These kinds of shoes can go very Country and Western on you if you aren’t careful. I suppose that’s great if you’re Ian Astbury. It’s not for me. Side note: can anyone explain why so many British dark/Goth rock outfits were doing all this American West stuff? I mean cowboy hats, cowboy boots, Native American mythology and imagery? Is this about equivalent to the American Goth with the fake English accent in a tailcoat? Finally, in the lower right corner a pair of low-heeled black boots by Kickers. These look like perfect everyday boots. The lower heel seems quite manageable. 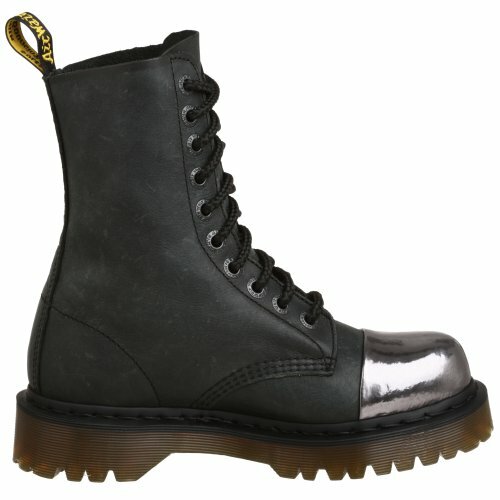 Gunmetal buttons reference Victorian-style ladies boots while keeping the overall look modern. Because there isn’t an excess of ornament, these would be quite adaptable to different situations.Perhaps not as exciting as glitter and all, but a pair of nice, basic boots. If you’d like to see these boots in their native habitats, please click here for my Kaboodle styleboard. Planning on acquiring any new boots soon? Tell me about it in the comments. This entry was posted on September 30, 2011 at 1:09 pm and is filed under Clothes, Fashion with tags black, boots, doc martens, docs, dr martens, glitter, goth, gothic, iridescent, leather. You can follow any responses to this entry through the RSS 2.0 feed. You can leave a response, or trackback from your own site.